A free airport shuttle, a spa with outdoor pool, and a 24-hour reception are offered at this modern, 4-star hotel in Berlin. Tegel Airport is less than 2 km away. 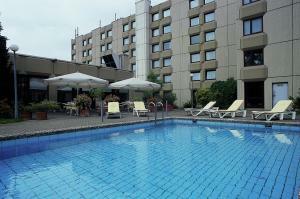 The Mercure Airport Hotel Berlin Tegel provides soundproofed rooms with satellite TV, air conditioning, and minibar. Wi-Fi is available on request.